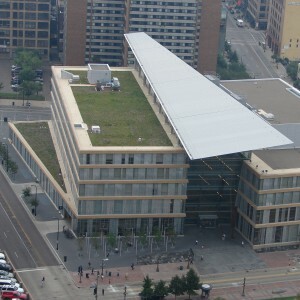 The conceptual design for the Minneapolis Central Library’s green roof weaves together local cultural and natural patterns. The concept emphasizes the influence of the Mississippi River on Minneapolis’ street grid and the library building design, as the river bend on which the street grids and library building are based is reflected in the green roof pattern of waves. The Mississippi River is emulated by waves created across plant palettes of varying, undulating heights, with 20-30 species in each palette. Wave patterns change seasonally as different waves are more apparent at different times of the year when prominent species are in bloom. Additionally, a seasonal wave movement is also superimposed on 3D wave patterns by a purple/pink burst of color that moves from west to east from spring to fall in accordance with the flow of the Mississippi River. The planting design also complements the frit patterns and geometry of the library windows. 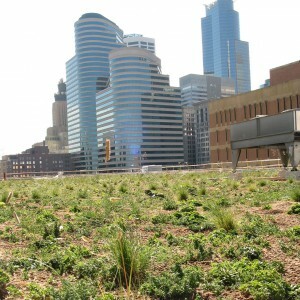 The metaphorical connection of the green roof design to the Mississippi River highlights the positive impact of the green roof as it mitigates the effect of storm water runoff from the roof on the Mississippi River. 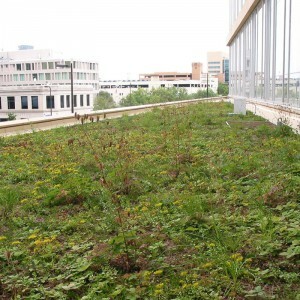 Further minimizing negative effects of roof runoff on downstream water bodies, the Central Library Green Roof is equipped with a cutting edge irrigation system that utilizes a 7,500 gallon capacity cistern system to collect, store, and distribute rainwater for use by the plants.